One area that worries many candidates is the idea that personality tests are designed to spot any attempt to influence the results. It is true that nearly all tests of this type have impression control questions built into them. These are questions that are designed to indicate whether you are trying to create an overly favorable impression – hence the name. Unfortunately for the test designers, they have yet to develop any impression control questions which are not blindingly obvious. I always keep other people's secrets. I am always full of energy. I can't remember ever being late for an appointment. I have never acted on impulse. I have never been bored. I have never been late in anything. I have never been moved to anyone. I have never disappointed anyone. I have never failed to reach a personal goal that I set for myself . I have never felt sad. I have never hurt anyone's a feelings. I have never lost a night's sleep worrying about something. I have never made a statement that was not completely true. I have never met someone I didn't like. I have never used bad language to anyone. I have planned ahead in everything I've done. I never regret my decisions after I make them. I never tell white lies. I never worry if I make a mistake. I'm happy to see people whatever the circumstances. I've never been deliberately rude to anyone. None of my close friends has ever upset me. All of my work has been appreciated and valued by others. These questions almost invariably use the words; ‘always’ or ‘never’ in relation to something where ‘occasionally’, ‘very occasionally’ or ‘usually’ would be an honest response. Occasionally, you will see ‘ever’, as in ‘None of my close friends has ever upset me’ or ‘whatever’ as in ‘I'm happy to see people whatever the circumstances’. In all cases, you are being asked to agree to some unconditional statement – which is what gives these questions away. You should answer these impression control questions honestly as disagreeing with a statement like ‘I never tell white lies’ will obviously not count against you. The only area where there is really any room for confusion with regard to impression control questions is the honesty/anger/stress questions. These are the only other types of question where you may see ‘always’, ‘never’ and other unconditional statements and be expected to strongly agree or strongly disagree with them. So whilst you should strongly agree with a statement like: 'I have never become angry at work', it is OK to disagree with the statement 'I have never felt angry at a supervisor or manager'. This is because the first statement is asking you if you have ever displayed an unacceptable behaviour at work, and you should obviously answer in the negative. The second statement is asking if you have EVER FELT angry at a supervisor or manager. If your answer claims that you have never felt anger, then this suggests that either you are lying or you don't care sufficiently about your job to ever feel angry, neither of which makes you look like a desirable employee. It is worth making a list of the honesty/anger/stress questions and the impression control questions and working through these systematically until you can appreciate the (sometimes) subtle differences between the two. As a general rule it is OK to admit to negative thoughts and feelings but do not under any circumstances admit to negative behaviour in the workplace. 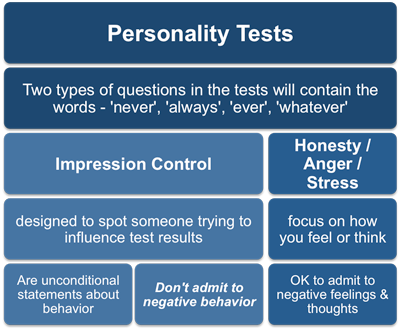 Qualities like, honesty, integrity, motivation, extraversion and leadership are only some of the personal attributes that the personality tests used for selection attempt to measure. They do however represent areas where you can easily ‘blow’ your chances if you don’t understand what the employer is looking for. Some of the other personality traits or facets may be equally as important – this will depend largely on the job you are applying for as well as the employer. How much you choose to try and influence the resulting personality profile is something only you can decide. Common sense would suggest that you should not attempt to influence the results too much as they will probably be seen to conflict with your past achievements and with how you are perceived at the interview.